Rene Villalobos is less than halfway through the 2016 Rocky Raccoon 100 in Huntsville State Park, Texas, when the pain in his back returns. A year earlier, he had fallen on a patch of black ice late at night during Arkansas’ Run LOVit 100K and slipped a disk. The doctors told him he wouldn’t be able to run long distance anymore but, well, here he was.He grimaces as pain shoots up his back. Soon the sun will sink beneath the canopy of oak trees and sweet gums overhead and out of sight. Villalobos uses a few unprintable words to gripe to his “friend” Sal (James Salvador), an Italian ultrarunner who encouraged Villalobos to quit dropping the F-bomb on long miserable runs and find the joy in running. Salvador had passed away nearly 10 years prior, in April 2002, during a low-risk planned surgery. He and Villalobos had been running together for 20 years by that time, and were planning to run several ultras together in the coming weeks. Instead, Villalobos found himself and his sister, Clara, with Salvador’s family as the priest read his last rites. Villalobos says he’s “not really too much into superstition.” He doesn’t have pre-race rituals or lucky socks. But he does have a lot of running buddies like Salvador who have passed away over the years, and he still communicates with them. 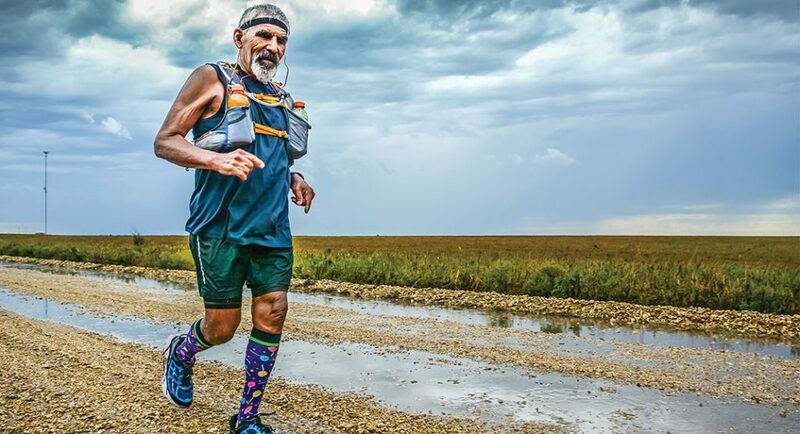 Rene Villalobos (who pronounces his name “Rain-E,” with a delightful Texan twang), 59, of Fort Worth, Texas, is not your typical runner-looking dude. He has dark skin, bronzed by hours in the sun, salt-and-pepper hair and a goatee to match; until a few years ago, he weighed over 200 pounds and possessed a hefty paunch.But looks may be deceiving in his case. Villalobos has run over 350 ultras, and over 150 100-milers. At one point, he ran nine 100-mile races in nine weeks. Counting unofficial races, by August 14, 2018 Villalobos says he had run 1,117 marathons. On the Mega Marathon List, he is ranked number five, with 1000 official marathon finishes. Let those stats sink in. While not a household name or podium contender, Villalobos epitomizes a passionate approach to trail running. His training weeks might make even the pros blanch (see page 62 for Villalobos’s weekly running schedule), especially because, for over 30 years, he worked digging ditches and fixing pipes as a plumber, often in 110-degree Texas heat, before going on his weekday runs. Things changed in 2004 when he got a job as Master Inspector for his hometown of Fort Worth. While he appreciates the air conditioning, being what he calls a “blue-collar runner” makes him proud, and he still does plumbing jobs for friends on the side. Villalobos’ house is spartan—there’s no TV and few wall decorations. The exceptions are his race bibs, including marathon-and-under bibs and medals, dispersed throughout his home like tiny monuments to his countless miles. During the 2016 Rocky Raccoon, Villalobos is using his best sailor mouth to complain to his angels, and “they just sit there laughing,” he says. “They’re probably saying, you paid for it, you dummy, why you out there? You ain’t got nobody to blame but yourself.”The Rocky Raccoon is made up of four 25-mile loops. It’s getting dark by the time volunteers and spectators catch sight of a Hispanic guy using a thick stick as a cane, moving slowly into the clearing. He’s obviously struggling—his stride is off, and he’s using the stick only halfway into the race. But he doesn’t stop. Villalobos hobbles back into the woods for his third lap, and, when he emerges again, he goes right on for the fourth. Volunteers watch with concern and hope. The finish line looks increasingly like a ghost town as people pack up and go home. In the woods, Villalobos repeatedly thumps the stick beside him like a third leg, occasionally griping to Sal, when no one else is around. He shuffles down the singletrack, over little wooden bridges, through brush and pine needles and endless roots as the sun rises. When he exits toward the finish for the last time, he is hunched over his stick, barely taking steps. He looks like he’s aged several years in a single night. In the miles since the last aid station, he’s fallen 20 minutes behind the cut-off time. But he has “finished.” Racers and volunteers have tears in their eyes as he crosses the line. He doesn’t get an official finish time, but the race organizers give him a finisher’s belt, “because they said I was tough,” Villalobos says. Saturday (If he’s not running an ultra): Wake up at 3:30 a.m. to run by 4 a.m. Run a marathon. Visit parents, who live a few blocks away from him in the suburbs. Monday After work, run a trail hill for about 2 hours (still tired from the weekend, he usually gets 6 miles done) to get the lactic acid out. Tuesday ½-mile hill repeats on pavement for 2 hours (about 10 miles, since today is a bit faster). Wednesday 1-mile hill repeats up what Villalobos calls the “Killer Hill.” 2hrs/10 miles again. Thursday Villalobos finally “gets to play.” 2 hours on a flat or rolling trail. He can usually “squeak a 9-mile loop” out of his favorite trails in Sansom Park, Fort Worth. Friday Rest day. (“It starts off rest, but it does and it doesn’t, you know?”) Villalobos foam rolls, “stretches like crazy” and straps icepacks on his back. He lies on an inversion table for 45 minutes. After he injured his back in 2015, Villalobos ignored his prognosis that he would never run again. In the month after his fall at LOVit, his place on the pain scale had moved from a 1 to a 10.Instead of admitting defeat, Villalobos began visiting three different chiropractors, foam rolling, hanging from an inversion-board for 45 minutes at a time and stretching constantly. He realized he was running quite a few pounds too heavy, became more conscientious about food and lost weight for the first time in his life. Now Villalobos is 45 pounds lighter than he was the day he injured his back, which his chiropractor says will help his back enormously. A year after he was told he would never run distance again, Villalobos put 1,800 miles on his legs. “I rebuilt myself like an old Chevy truck,” he says, laughing. Not only is Villalobos largely unconcerned with time, he eschews the big-name races of the sport. He calls these races the “Boston Marathons of trail running,” because to him Boston and Western are two faces of the same beast—both are names a popular culture recognizes, and attract bragging-rights bounty hunters. Instead of registering for famous 100-milers, they register for smaller unknown races that need more money and support. Indeed, peruse Villalobos’ (vast) ultrasignup resume, and you’ll see the bulk of his ultras took place in his home state of Texas, and many others in off-the-radar states like Oklahoma, Kansas, Arkansas, and Louisiana. Villalobos expends a lot of effort not only reaching out to people on the trail, but creating spaces to invite new runners into the fold.Every Saturday and Sunday for the past 15 years (excluding those when he’s racing ultras), Villalobos has woken up at 2 a.m. to post on Facebook about the Joe-and-Ben-a-thon, his free community marathon at Sansom Park in his hometown of Fort Worth, Texas. The Joe-and-Ben-a-thon, named for two of his late trail-running buddies, is not so much a race as an open invitation. Villalobos sets out aid stations at the 5K, 8-, 12-, 16- and 24-mile marks along the same marathon loop every weekend, whether he ends up running the route alone or with 20 people. In the summer, when homeless people snag water from his untended aid stations, Villalobos simply sets out extra. Afterward, Villalobos pops his truck shell open to reveal a runner’s cornucopia nestled in the back: bars, Gatorades, peanut-butter pretzels, iced watermelon, nuts and gels. Villalobos invites everyone to join, strangers and friends alike. Villalobos’ friends and fans refer to him as “King of the Trails,” and the back of this truck is his feast hall, bringing new runners to the table, building a community around an old truck. All this comes out of Villalobos’s own pocket. His race is free “because I think that’s a part of running, and I think that’s how it should be. Growing up poor, he never wanted to get involved in a sport that would cost his parents a lot of money. As a runner, he could buy himself a cheap pair of shoes for $3 or $4 and just hit the road. After he packs up the aid stations from his weekend marathons, Villalobos goes to his parents’ house a few blocks from his own, and helps his sisters care for their mother, who has fourth-stage Alzheimer’s, and his father, who is disabled. Villalobos says his father’s side of the family are big jokesters, and will “give you a shirt off their back, even if they don’t have a shirt.” He says his mother, on the other hand, is more of a stern protector. “She wouldn’t hesitate to bump heads with you,” he says affectionately, and as he describes his family you can see the two sides of Villalobos taking shape: kind-hearted and stubborn as hell, in nearly equal parts. But Rene would always pay her entry fees. When their extended family wanted to be more health conscious, Villalobos started hosting an annual race at their family reunion, giving away old race T-shirts (autographed, since he’s a bit of a family legend) as prizes. On Villalobos’ own runs, he never hesitates to take a new runner (or several) under his wing, whether it’s for a few miles, or a few years. In fact, his two best running buddies—Callahan and Ramirez—are also mentees of sorts. Villalobos even refers to Ramirez as “my protégé, my next in line, the next me.”Both Callahan and Ramirez were struggling on the trail when they met Villalobos—Callahan was training to conquer his dreaded marathon bonk, and Ramirez was at a standstill deep within the pain cave, 40 miles into his first 50-miler. Soon Villalobos had coached Callahan over and far beyond his marathon wall, and Ramirez was running his first 100-mile race with (guess who) at his side. Callahan says Villalobos is like his big brother he can talk to about anything. They’ve both taken up Villalobos’ torch since then, running 100-milers they would have never even considered toeing the line for before they met him. Villalobos paced Ramirez through his first 100-mile race, running the first 70 miles by his side, guardian-angel style, before giving him a few parting words of wisdom and taking off. “I think he could’ve won it if he hadn’t been with me,” Ramirez said. Instead, Villalobos placed second. Villalobos frequently reaches out to disheartened racers who are considering DNFing, encouraging them to push through the haze of exhaustion and finish the race. Often he’s one of the last runners across the line, because he stayed behind to keep a straggler moving to the impossibly distant finish. When people thank Villalobos, his response is always the same: return the favor. It’s impossible to say how many runners have taken this message to heart, but Ramirez and Callahan sure did. They are the first ones to offer water, food or company on a dark night to a stranger, or to echo Villalobos’s optimistic words about ups and downs. Brooke Stephenson is a runner, writer and student at the College of William and Mary in Virginia. This article originally appeared in the December issue of Trail Runner magazine. The post The King of the Trails appeared first on Trail Runner Magazine.